Formerly the country estate house of William Pryor Letchworth, the Glen Iris Inn has welcomed guests as a country inn since 1914. The Inn overlooks the magnificent Middle Falls in Letchworth, plummeting deep into the Genesee River Gorge – and serves as the premiere lodging and dining experience within Letchworth State Park. Enjoy lunch, dinner and/or drinks on the veranda – walk-ins welcome! 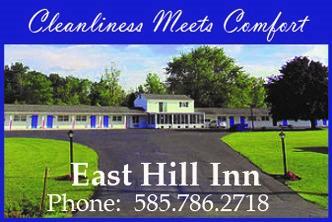 The Inn is open from April to October, so book your room now by visiting their website or by calling (585) 493-2622. More Details. Constructed in 1935 by the Civilian Conservation Corps (CCC), the 46-foot-long stone arch bridge stands 35 feet above the Genesee River, and serves as the only pedestrian crossing of the Genesee River in Letchworth State Park. 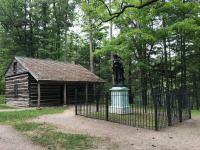 The Stone Museum is located across the road from the Glen Iris Inn and contains artifacts and information about the park, the native people that inhabited the Genesee River Valley area, and the life of William Pryor Letchworth. More Details. 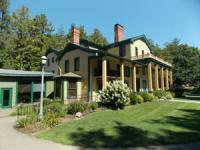 Located on the bluff above the Glen Iris Inn at Letchworth State park, the Council Grounds consist of two dwellings. The first being a Revolutionary War-era Seneca Council House. The second cabin belonged to Mary Jemison, the White Woman of the Genesee, which was built in 1800 and originally stood on the Gardeau Flats by the Genesee River. The Humphrey Nature Center opened at Letchworth State Park in June 2016 and offers year-round environmental education opportunities for school groups, scouts, youth organizations, and the general public. The center focuses on the main topics of interest around the park, including geology, wildlife and botany. The building is open daily 10:00AM – 5:00PM. Outside you will find an outdoor classroom, butterfly garden, a bird observation station, and sustainable features such as solar panels and a cistern for collecting rainwater. 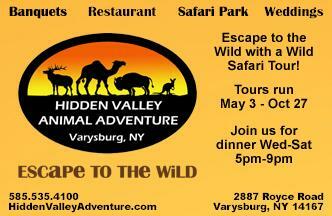 For more information, call (585) 493-3680. More Details. The Mount Morris Dam & Recreation Area is a major flood control project and public park located on the Genesee River in Letchworth State Park. The dam is situated deep in the Genesee River Gorge and the adjoining recreation area offers a variety of recreational opportunities to the visiting public. Walking Tour Schedule: April 1st - October 25th, Monday through Thursday at 2:00 p.m., and Friday, Saturday, and Sunday at 11:00 a.m. and 2:00 p.m.